“Powered by fairy dust, crewed by legends” is the tag line on the stern of Derry~Londonderry~Doire which finished as runner up in the Clipper 2015-16 Race, a mere four points behind eventual winner LMAX Exchange. 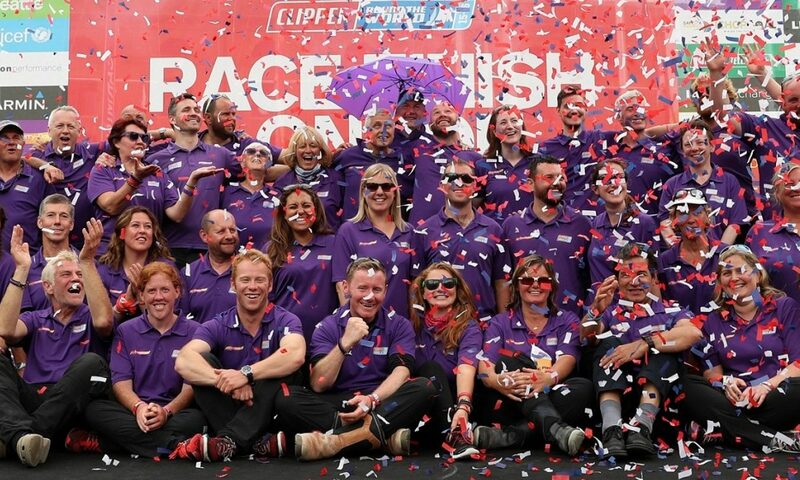 With four individual race wins and three second place finishes, there was certainly more than fairy dust powering this crew around the world and while doing so the Northern Irish entry managed to maintain that certain sparkle for which its become famous in the six year partnership with the Clipper Race. Skippered by Daniel Smith from West Kilbride in Scotland, the celtic vibe permeated though the team which became recognised as a possible overall race winner early on. After narrowly missing out on a podium to GREAT Britain in the closing stages of Race 1, Derry~Londonderry~Doire claimed second place into Cape Town and also picked up a couple of extra points for having the second fastest time to the Scoring Gate. This was followed by another impressive performance across the Southern Ocean to Australia with the team finishing second again behind LMAX Exchange, collecting two points at the Scoring Gate and another two for recording the fastest time in the Ocean Sprint. All of which combined to seeDerry~Londonderry~Doire move to the top of the leaderboard at the end of October, an achievement which just happened to coincide with the Skipper’s birthday. The All-Australian Leg saw a dip in form for Derry~Londonderry~Doire as it failed to replicate its earlier successes. 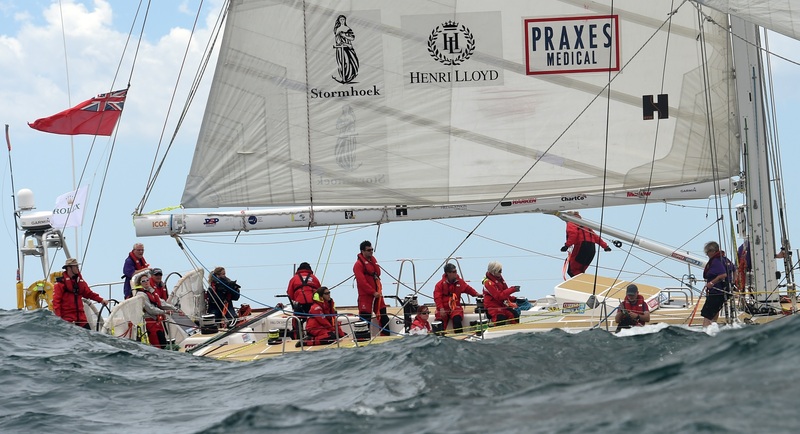 However the strength of team spirit aboard was evident in Race 4 when the crew decided to divert to Hobart to allow circumnavigator Mike Gaskin to seek medical attention due to suspected fractured ribs, sacrificing its race position in the meantime. As a resultDerry~Londonderry~Doire tumbled down the standings finishing 10th and losing its spot at the top of the overall race. However, with Mike back on board for the Sydney to Hobart race and after departing Airlie Beach in early January, the team hit its stride in Race 7 to first-time host port Da Nang in Vietnam. This race was a defining moment in Derry~Londonderry~Doire’s round the world race. Having passed through the Scoring Gate in second place they proceeded to overtake GREAT Britain and storm through the Ocean Sprint and well into the lead to finish in the top spot on the podium with a whopping 16 points. Having tasted success Derry~Londonderry~Doire achieved the much coveted result in Race 8 to Qingdao, winning the race to the Scoring Gate, winning the Ocean Sprint and winning the race itself, and adding the individual race maximum of 17 points to the leaderboard. The stopover in China’s Sailing City coincided with St Patrick’s Day and theDerry~Londonderry~Doire team made it their mission to organise a party for all the Clipper Race crew and staff. A trio of birthday celebrations were also had for Paul Upson, Steve Waters and Sir Robin, who all joined together on stage for cake, karaoke and some good old fashioned Irish dancing. A third consecutive win followed in the Seattle Pacific Challenge and by this stageDerry~Londonderry~Doire was stretching away from third placed GREAT Britain in the overall race and looked to be closing in on leader LMAX Exchange. By then, the crew had already been joined by three crew members who had received bursaries from their Team Sponsor Derry City and Strabane District Council, with another two still to come on the final two legs. Three bursary recipients David Pollock (Leg 4), Colin Shortland (Leg 5) and Jilly St John (Leg 7) were all candidates from the Your Next Chapter bursary, brought in by the council to inspire those out of work to gain skills through sailing in the Clipper Race that would improve their chances of employment once they returned home. As the first candidate to complete his race leg, David Pollock led the way upon returning home too in gaining full-time employment for the first time in years shortly after he got back to Derry-Londonderry from Australia. The transformation in David did not go unnoticed by his team mates either. Murat Kece who also joined the team for Leg 4 said: “When I first met David in Derry-Londonderry during our team building, my first impressions were not great. His language was terrible and in my country, it causes great offence in Turkey to hear people swear like that. At first it made me think we could have a problem on board together. “However when I joined the All-Australian Leg and met David again, four months later, I was immediately pleasantly surprised at how much he had changed his attitude. He was very positive and very engaging and his language and communication was far improved and very good. He wanted to help everybody all the time and I was immediately really impressed with his overall behaviour and engagement on the boat. “It was great to witness first-hand how much he has benefitted and taken from his race experience. David really grasped his opportunity fully, with a lot of enthusiasm and I think his lessons and development will open many doors for his future,” added Murat. Shane Brunker and Danny Bryce completed the bursary relay team from Western Australia to Race Finish with them two men doing Legs 6 and 8 respectively. Both had been nominated by people within their communities in Derry-Londonderry for the Voice of the Community Bursary as a result of their voluntary and charity work. The two bursary places were gifted to the city by Sir Robin and William Ward in celebration of the successful three race partnership with the city and district. Danny was fortunate enough to be on board for the tightly contested Race 12, the LegenDerry Finale back to his home city and it was an emotional homecoming for the local man retracing the routes of his ancestors who had left Ireland during the Great Famine only to return across the Atlantic generations later. The final miles to the finish line off Greencastle were nail-biting as Derry~Londonderry~Doire fought it out with LMAX Exchange for a rare home port win. However rounding Rathlin Island, the tides and winds worked in favour of LMAX Exchange and it crossed the line 33 minutes ahead of the home team. The drama of the race and closing stages was documented in this emotive video by 1080 media, The Journey Home. What a welcome that turned out to be. Tens of thousands of people lined the quayside for the fleet arrivals and throughout the Foyle Maritime Festival as Clipper 70 motor sails on the river sold out, open boat days were inundated with visitors and local businesses ‘adopted’ a team each to show them the best of Northern Irish hospitality. Derry~Londonderry~Doire took centre stage throughout the week, especially at the public Prize-giving event in the Guildhall Square where Irish rock sensations Seo Linn blasted out the team song Avicii’s Wake Me Up in Gaelic, a hit which has had over a million views on YouTube. A sustained social media campaign by the team’s supporters saw them crowned winners of the Stormhoek Social Spirit Award in their home port, giving another excuse to celebrate. Once back on board and whilst racing towards Den Helder, local man Kieran Lynch (Legs 7 & 8) was pleased as punch with the spectacle his city had put on for his fellow Clipper Race crew. “I would like thank the thousands of you who turned out to see use both on Saturday night at the festival of lights parade and of course the leaving party. All the crew on board felt a great sense of pride to be representing the city. We were all made to feel like superstars on our stopover. “The highlight of my week was being paraded around the historic walls of the city and getting to stand in front of you all to collect our second place prize. The bands and entertainment were second to none and the atmosphere generated by the crowd was amazing (I think half of them were my family). Ruth seems to think I know half of Derry and the other half know me,” wrote Kieran in his final crew diary as a thank you to the team’s supporters. With plenty of racing yet to be done Derry~Londonderry~Doire knew by now that they had secured second place in the overall race standings, and with seven points between themselves and LMAX Exchange that there was still a chance of overall victory. The teams finished a place apart in Race 13 with Derry~Londonderry~Doire managing to claw back one more point. This made the final sprint to London all the more tense, with everything to play for in the final 198 nautical miles of more than 41,000 of racing, and Derry~Londonderry~Doire went for it! After a dramatic start off Den Helder in which the team crossed the start line first, only to have another team minutes later question whether they had rounded an official mark,Derry~Londonderry~Doire suddenly found themselves going from first to last as the decision was made to turn around and round the mark a second time as a certainty, with every possibility that their dreams of victory into London had been dashed. However true to form and the now ‘LegenDerry’ spirit, within the hour the team was back up with the leaders and from then on was never far from the front of the fleet. A battle ensued with LMAX Exchange and Visit Seattle as slowly the three made ground away from the rest of the pack. Derry~Londonderry~Doire knew that they needed LMAX Exchange to finish seven places behind in order for them to clinch overall victory and despite the fact this now looked unlikely to happen, they made one final victory their goal. As dusk settled in the second and final overall day of racing, Derry~Londonderry~Doire and Visit Seattle edged ahead of LMAX Exchange making this a two yacht tacking frenzy for the line. At 20:14:39 UTC Derry~Londonderry~Doire crossed the finish line in first place, 29 seconds ahead ofVisit Seattle, for their fourth victory in the Clipper 2015-16 Race, making this the tightest victory of the entire circumnavigation. With LMAX Exchange following closely in third, they had to settle for second place overall, but the team was satisfied knowing they had given their all, and gotten their team on the overall podium for the first ever time. So Skipper Dan and all the crew congratulations on an epic race and for being the firstDerry~Londonderry~Doire team to get on the overall podium. Thank you for keeping us on the edge of our seats and glued the Race Viewer, for all the time you took to do interviews, write blogs and take photos, and for doing it all with a smile Stefan Ammann, Gary Barr, Nicholas Battle, Michael Berry, Siobhan Besley, Alison Boeree, Sascha Bonus, Beverley Brown, Danny Bryce, Shane Bunker, John Carroll, Ruth Charles, Janet Chatzis, Christina Cunningham, John Curtis, Sinead Diver, Eleanor Fearon, Michael Gaskin, Joe Grosjean, David Harvey, Chris Hawthorne, Josephine Hillan, Stephen Jackson, Rebecca Jeffery, Matt Jess, Dafydd Jones, Muharrem Murat Kece, Steven Laycock, Andrew Leviston, Kieran Lynch, Paul Mills, Anthony Milsom, Olive Moynihan, Ian Niblock, Sharon O’Donnell, Diarmuid O’Donovan, Eileen O’Farrell, Stepan Okunkov, Rebecca Ormisher, Eimear Owens, David Pollock, Adrian Prior, Kevin Proudman, Brian Reid, Gemma Roberts, Phillip Roswell, Robert Ryan, Dion Sherrard, Ali Sholer, Conor Shortland, Sally Spence, Jilly St John, Lea Stam, Jennifer Stephen, Sarah Thompson, Paul Upson, Steven Waters, Stephen Wheatley, Clodagh Whelan and Sara Winward. To read more about the Derry~Londonderry~Doire crew’s experience in the Clipper 2015-16 Race click here to read the crew diaries sent back while they were racing. Next PostNext Time For the Fastnet!